Enjoy a relaxing massage in the comfort of the massage room – or perhaps head to the gym to prevent any midriff spread from all that delicious food on offer! 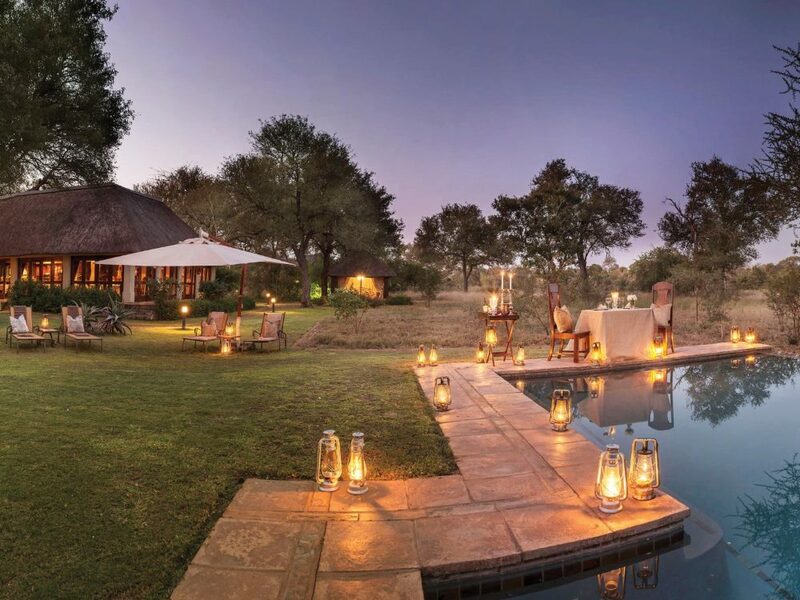 Deep within the Timbavati Game Reserve lies King’s Camp, one of the more upmarket lodge options in this famed Big Five reserve. For us the highlight here definitely has to be the luxurious and spacious suites which are some of the most attractive in the reserve – the epitome of colonial style luxury in fact. 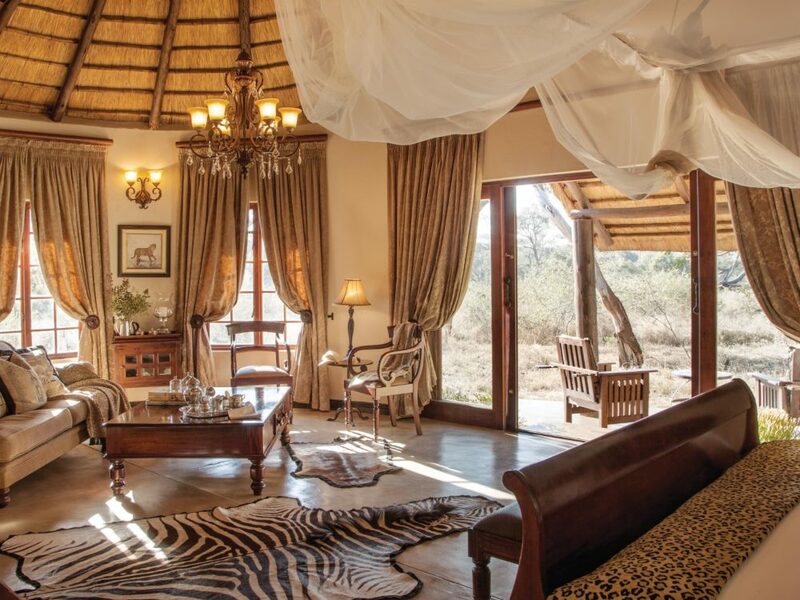 But with great personal service, fantastic food and reliably excellent game viewing it offers a real five-star experience that’s well…fit for a King. With a view over a wide open savannah plain and very active waterhole teeming with wildlife, it’s easy to see why King’s Camp can be considered a stand-out example of a luxury safari lodge. With 10 beautifully decorated and furnished suites (8 Colonial Suites as well as 2 Honeymoon Suites boasting their own private plunge pools), King’s Camp combines first-world luxury with the raw charm of the African wilderness to create an experience that offers the best of both worlds while compromising on neither. The rooms follow a traditional South African rondavel-style design, and utilise elegant and beautiful dark tones of varnished hardwood and thatch to great effect, producing a striking colonial allure. This sense of the glamour of a foregone era is echoed in the décor: genuine animal pelt rugs and floor mats, as well as silverware polished to a gleam work together to bring an undeniable sensation of class and luxurious poise. The bathrooms have Victorian ball-and-claw bathtubs, which complete the package – however, they also go the extra mile by boasting both indoor and outdoor double showers for those who want to rinse off the day’s dust under the stars or the comfort of a roof. Light and space are key elements to the room design: wide sliding glass doors open up fully to let the breeze and sunlight pour in. All rooms, however, also deliver on modern conveniences: complimentary sherry and an arranged fruit platter welcome every guest into their new home away from home, and an espresso machine ensures that rich, steaming Java is just a button-press away. They’re also fully air-conditioned (good for those especially hot days under the sweltering African sun) and are adorned with a range of bird and animal books. And if you’re a romantic couple on their honeymoon or a married pair looking to reignite that spark, the Honeymoon suites are a must: what better way to indulge yourselves on a romantic safari getaway than with your own private plunge pool overlooking the bush, a glass of bubbles in your hand and surrounded by softly glowing oil lamps on all sides? To our eyes at least the actual public areas aren’t perhaps as attractive as the interiors of the suites. The various buildings that make up the public areas remind us a little too much of a suburban house in terms of the architectural style compared with many other game lodges (and the extensive manicured lawns probably add to that impression) Having said that there is no doubt that King’s Camp is very well endowed with facilities. There’s a well-equipped gym in its own building as well as a small massage hut where you can get any remaining city stresses gently pummelled away. Then there are various lounges and decks where you can relax with a good book or keep an eye on the wildlife drinking at the waterhole whilst you enjoy an ice cold beer. Another highlight of King’s Camp is the delicious food which is consistently raved about by guests - settle down with your personal ranger for a scrumptious gourmet meal around a roaring fire in the traditional boma to recap the day’s events and you’ll see what we mean! Talking of which the game viewing on offer at King’s Camp is top class. Tucked away in the depths of the Timbavati Private Game Reserve, King’s Camp offers over 100 kilometres of traversing in open-air custom-designed Land Rovers – and in keeping with its upmarket status (and prices) the lodge restricts the number of guests per vehicle to just 6, ensuring extra space and comfort out on game drive. 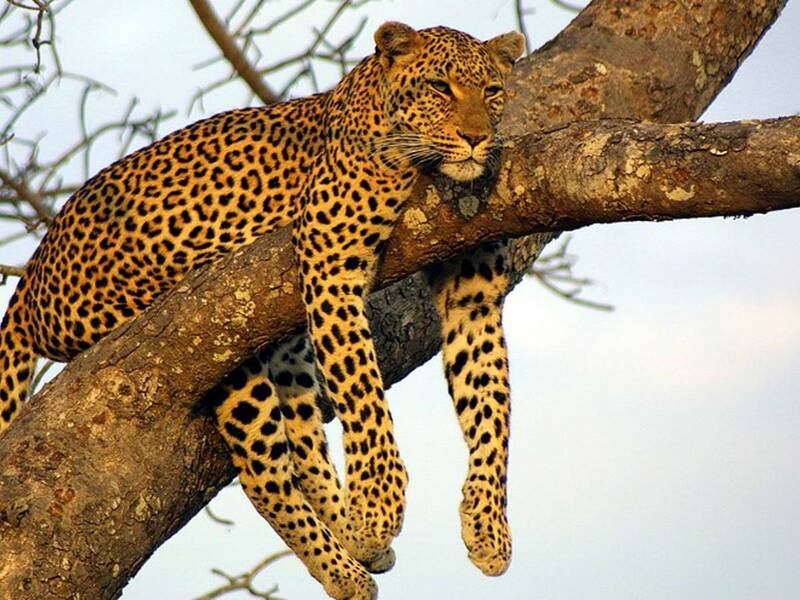 While one of Timbavati’s claims to fame is being the home of the legendary African white lion, it is also home to a huge diversity of wildlife and being open to the Kruger Park you may be lucky enough to see the huge herds of buffalo and elephant that pass through that simply isn’t possible in the fenced reserves. These twice-daily game drives are at dawn, and during the late afternoon after the worst of the midday heat has subsided. The dawn drives are a treat – steaming tea, coffee and snacks are served before you set off, which work wonders to appease that early morning grumpiness that stems from having to leave so soft a bed so early. King’s Camp also offers a private lunch right outside the waterhole, allowing you to dine right up close with the drinking animals – a must if you’re here with your romantic other. The evening drives are no less an occasion, just with ice-cold drinks and canapes to go along with the stunning sunsets! Children under 12 years pay 50% if they share a suite with 2 full paying guests; otherwise the full adult rate applies.